Submachine Zero: Ancient Adventure is the latest Submachine sequel released by Mateusz Skutnik aka Murtaugh. Designed in August to enter the first Game Design Competition organized by Casual Gameplay, this new adventure offers similar gameplay and atmosphere as the other Submachine games, but in a shorter way. 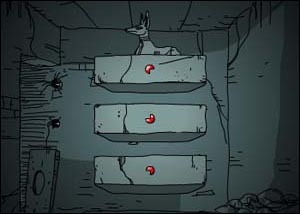 This one is easy, and you will only collect a few objects to use through the small labyrinth. With its very nice graphics and its mysterious background, Submachine Zero is another perfect Room Escape distraction for a short lunch break. 01. Go left and get a stone tongue. 02. Go right and get another stone tongue and a lighter (in the wall). 03. Go back to the main entrance. Drag the tongue #2 onto the left dragon’s mouth and the tongue #1 onto the right dragon’s mouth. The door opens. 04. Go in the tunnel. Use the lighter to light the candle and go down. 05. Go left. Light the candle. 06. Go down. Click the button on the left wall. 08. Go left and rotate the block on the stand. 09. Go right, go down, go right. Light the candle. 10. Go down, light the candle, go right. Get the first red jewel. 11. Go back left, up, left, up, left. Rotate the block again. 12. Go right, down, right, down, down and get the second red jewel. 13. Go up, up, left, up, left. Rotate the block again. 14. Go back right, down, right, down, left and get the third red jewel. Get the stone on the right. 15. Go back right, up, left, up, right, right. Light the candle. Use the stone to block the spears. 16. Place the jewels in the altar from top to bottom. Go down. Congrats and feel free to subscribe to FreeGamesNews feed! Once inside the door and down the stairwell, I can’t move anywhere after I light the candle. I can’t un-select the lighter and I think therefore I cannot play any further. Does anyone else have this problem? You have to click far to the right, really far. Almost off the screen. This should solve the problem. i cant de-select the lighter help!!! I can’t find the stupid candle. I’ve tried clicking everywhere. I must be blind or something. Help. All in all I think this game is rather short. I can’t find out what to do after I’ve got the jewels? I did it all….but…stuck like a few people before me….can’t block the spears…but i can get back to the turning stone…but can’t place the gems…why? i will not wreck the surprise for you peeps and by the way it’s crappy. Eh kinda dissapointing. Wasn’t all that difficult or very long. His first 2 were like “Whoa! No way am I going to be able to solve these!” then his 3rd game was like, “Aw Man!!! No pages? or Story?” now its like “CRAPPY!” I hope that if he makes a new one that it will be better than this one. WHERE THE HELL’S THE CANDLE?!?!?! THERE IS NO FREAKIN CANDLE!!!!! SHUT UP ABOUT THE FREAKIN CANDLE!!!! where the hell is the lighter? where is the stone exactly? *** that sucked compared to the other submachines! too short, too! someone please leave a detailed way to find the candle…i cant find it!!! what everyone is failing to mention is that there is no candle until AFTER you go down the hole. after that there’s a candle on the left. THEN you can keep going. oh and if you’re having trouble de-selecting the lighter, click pretty far over to the right of the black area and it jumps back into place. Where is the block to the spears. Wow, so easy… and short… crap compared 2 others, exept 3 wich is also crap. You’ve got to be kidding me, only a Wisdom crystal thingy!? Ok guys, the stone you use to block the spears is inside the left room where you find one of the jewels. Posted on Tuesday, September 12th, 2006. Follow any responses through the RSS 2.0 feed.